ARC Sydney proved to be another huge outing for Bisazza's new ceramic collection: Frozen Garden. At a very busy On Seven Ballroom, on Castlereagh Street, it was the turn of Sydney's interior designers and architects to get to grips with the striking Marcel Wanders designed range. 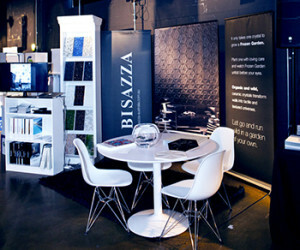 ARC visitors were able to handle actual tile samples and view the displays at Bisazza Australia's stand. The Bisazza team continue to be amazed by the stir that Frozen Garden is causing, wherever they go. And at Sydney in particular, visitors were staying and chatting and handling the samples for quite some time before continuing around the room. Although their reaction is understandable, as Frozen Garden really is something very different - a highly tactile product for modern, elegant interiors. ARC Melbourne, 15th May 2014 at Zinc at Fed Square, Cnr Federation Sq/Swanston St., 6.30pm - 8.30pm. 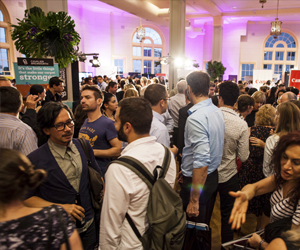 For a frantic two hours last week, the Brisbane interior design and architecture community descended on the ARC Event, held at Lightspace in Fortitude Valley. 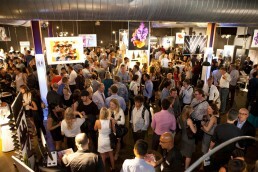 The entire evening was busy, buzzing and extremely well attended. The Bisazza Australia team were showing off Frozen Garden, the stunning new Ceramic collection by Marcel Wanders, with displays and physical samples for show-goers to get to grips with. Frozen Garden caused such a stir that none of the Bisazza team had a moment to draw breath during the entire two hour event, as a constant flow of people came by wanting to see, touch and talk about the tile samples. And who can blame them? Frozen Garden's angular crystal design and matt finish make it truly distinctive and very special. For the first time ever, Bisazza has introduced ceramic into its 2014 collection. Frozen Garden is a wall cladding collection that creates a stunning backdrop. An unusual matt finish accentuates its angular crystal design, which is interspersed with geometric flower details. The collection is another masterpiece from Marcel Wanders, whose work is exhibited worldwide at MOMA New York, London’s V&A and the Stedelijk Museum in Amsterdam. Simple and elegant, Frozen Garden is available in black or white tiles and is created with premium quality white clay. Origini is a flooring collection, which ironically, begs to be touched. Each tile is subtly textured with a scattering of embedded glass chippings, giving the design a truly mesmerizing quality. A white or black option is available with the evocatively named Cenere (Ash) or Lava tile colours. Acromi, the second flooring collection, celebrates simplicity with a range of eight warm, subdued colours to perfectly complement any living space. Ossido in particular has a truly extraordinary thunder cloud quality to the colour. Driven by the entrepreneurial fire of Bisazza, and with the commitment of highly respected international designers, Collezione Ceramica 2014 is just the start of a whole new, creative way to enjoy the luxury of Bisazza. Bisazza's stand at CERSAIE was, as usual a focal point for visitors. 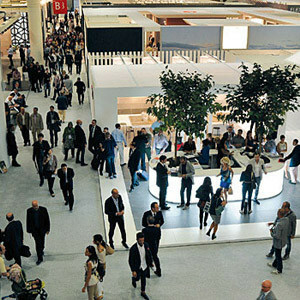 The company occupied a large stand space and used this iconic show to reveal a preview of the exciting Collezione 2014. Highlights included a look at the stunning Ceramica Collection launching in 2014, plus brand new glass mosaic tile collections from leading international designers Antonio Citterio Patricia Viel Interiors, Paola Navone and Marcel Wanders. 2014 is a very exciting year for Bisazza with a lot of new developments. Look out for breaking news.